Chestnut, Stonie and Sudo return for Saturday’s Annual Day-Lee Foods World Gyoza Eating Championship in Little Tokyo. Saturday will mark the 10th annual Day-Lee Foods World Gyoza Eating Championship, where the world’s top competitive eaters will gather in Downtown L.A. and see how many gyoza (Japanese potstickers) they can down in 10 minutes. Joey “Jaws” Chestnut — the No. 1 competitive eater in the world as ranked by Major League Eating (MLE), the reigning Nathan’s Hot Dog Eating Champion, and the World Gyoza Eating Record holder (384 gyoza) — will be back to reclaim his title. Matt “Megatoad” Stonie, the 2015 Gyoza Champion and No. 2 competitive eater in the world, will return, as will Miki Sudo, world No. 3 and reigning Women’s Nathan’s Hot Dog Eating Champion. Last year, Stonie gobbled down 377 dumplings, besting Chestnut by a slim margin of four. Sudo finished with 178 gyoza eaten. The Day-Lee Foods World Gyoza Eating Championship is the premier competitive eating event on the West Coast and is notorious for hosting the world’s top competitive eaters. Competitors are challenged to devour as many Day-Lee Pride gyoza as possible in 10 minutes. They will be chowing down on nothing but the best; Day-Lee has been making their famous high-quality gyoza with generous filling, less dough, and no MSG for decades. Aside from consuming platefuls of gyoza, they will be vying for a $5,000 cash purse. “The Day-Lee Foods World Gyoza Eating Championship is undoubtedly a marquee event on our calendar,” said Rich Shea from Major League Eating and the International Federation of Competitive Eating. “Over the past decade, our competitors have shocked fans by making huge strides in their capacity for gobbling up gyoza. Part of the 76th annual Los Angeles Nisei Week Japanese Festival, the eating championship is hosted by the Nisei Week Foundation and sanctioned by MLE and the International Federation of Competitive Eating. The showdown will take place at the Japanese American Cultural and Community Center Plaza in Little Tokyo, 244 S. San Pedro St. 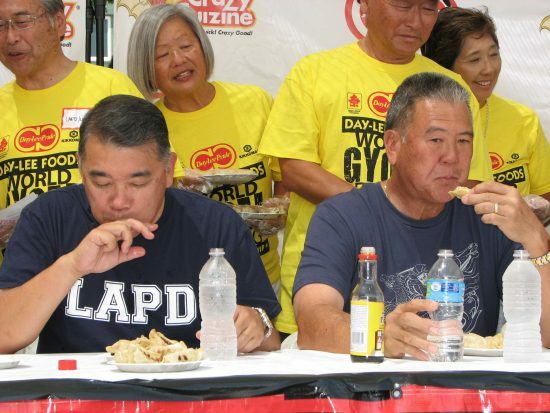 The main event will start at 3 p.m., following the Little Tokyo Eating Championship amateur contest, which traditionally features the outgoing Nisei Week Court, at 2 p.m. and the L.A. Police Department vs. L.A. Fire Department Gyoza Eating Challenge at 2:30 p.m. Admission is free; limited seating and ample standing room will be available. Additional information for the Day-Lee Foods World Gyoza Eating Championship can be found online at Facebook and Twitter @EatMoreGyoza. Day-Lee manufactures Day-Lee Pride, a line of six types of gyoza found in Asian and Japanese grocery stores throughout the U.S.; and Crazy Cuizine, a line of Asian classics such as Mandarin Orange Chicken, Teriyaki Chicken, Korean BBQ, and Chicken & Pork Potstickers.